Frontline Assembly are one of those bands I have often heard about, but never actually listened to. FLA are mostly Rhys Fulber and Bill Leeb. Fulber we know from producing most latter day Fear Factory albums and doing also a lot of remixes for other metal bands. Leeb and Fulber together also play in a more ambient band called Delerium. Civilization is already FLA's thirteenth (!!!) album since they started in the mid-Eighties, and I have to confess that I was expecting more metallic sounds, considering Fulber's affinities for metal bands. Anyway, there's guitar only on two tracks (Vanished, Civilization), the rest mostly consists of Fulber's programming skills. 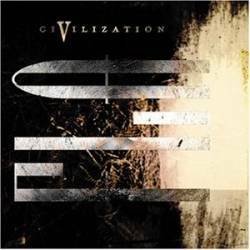 Any lesser musician would have created a boring album, but Civilization is in my opinion a very sophisticated album, combining abrasive electronics, ethno ambient parts, technoid rhythms and sometimes, as on Fragmented, even a certain symphonic lushness. The vocals are distorted beyond recognition, giving the music an even more clinical, sterile touch. This would be the perfect soundtrack for a stylish sci-fi noir movie or background music while reading the newest cyber punk revelations. Civilization is a pleasing album, but I am not able to rate it, being totally unfamiliar with what FLA have done in the past and not knowing if this is now a really good album for them or rather a letdown. If you like electronics with a threatening mood, you might want to check this out.